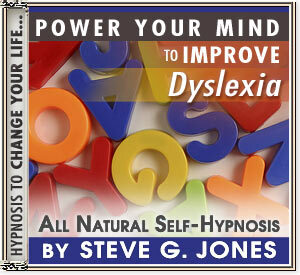 Power Your Mind naturally with Hypnosis to Improve Dyslexia! YOUR SUBCONSCIOUS MIND HOLDS THE KEY TO IMPROVING LIMITATIONS ASSOCIATED WITH DYSLEXIA! It has been well-documented that there are a great many successful and famous people with dyslexia. Albert Einstein, Leonardo da Vinci, Muhammad Ali, George Washington, Winston Churchill, Andy Warhol and John F. Kennedy are just some of the incredible people in history who are said to have either had dyslexia or who exhibited symptoms and/or learning difficulties. And each one of these people serve as shining examples of just what can be achieved, despite the most difficult of circumstances. However, while such examples may provide inspiration, in reality (and as with most situations in life) there can be great chasms between 'not coping' and successfully coping; and despair while trying to get from once place to the other - particularly when one method might work for some, but not others. If you have dyslexia, what do YOU do? How are YOU coping? Many people cling to traditional medical interventions, or turn to faith; or on the other hand, start reacting negatively, avoid the problem without considering or exploring all solutions, start hating themselves, or sadly just give up. But what do you do when you've gone through all of that and there is still little or no improvement? And, moreover, what do you do when your reading and learning abilities improve, but the depression, lack of confidence or anxiety persists? For those who have been diagnosed with dyslexia or learning difficulties, our Power Your Mind to Improve Dyslexia Hypnosis CD or MP3 provides a different solution to try when you want to improve your life - particularly if you have found that conventional methods of coping are not helping, or if you'd like to try something that could potentially boost positive results. Hypnosis can be used as an alternative or as a complimentary method of tackling all kinds of difficult situations; and is a powerful way of reaching into the subconscious mind to overcome limitations, including many of those associated with dyslexia.